The grizzly bear raised its large head to get a good look, sniffed and continued moving towards us. I remember saying to my friend, “F- F- F- F- Frank there is a grizzly bear coming towards us!” You are not supposed to stare into the eyes of a bear or run as either might trigger an attack. I didn’t get a photo of that Grizzly bear, and I rarely go hiking in the Canadian Rockies without bear spray and a few bear bangers. Bear Spray is reported to be 95% effective in warding off a bear attack, but to work you have to be a few feet from the bear. Bear bangers give off a loud noise and can be deployed at a greater distance, you just need to be careful not to fire them so they land behind the bear or he might come running toward you. Actually, I love to photograph Grizzly bears from a safe vantage point. Most of the Grizzly bears I have photographed have showed no sign of aggression. Still, the safest way to photograph bears near the road is from your car. I often see Grizzly bears in the Canadian Rockies feeding on dandelions next to the road in the early morning hours. Another safe way to photograph bears is from a boat. On the west coast within the Great Bear Rainforest located in Northern British Columbia, I have photographed Grizzly bears in remote estuaries from a kayak or zodiac. In these remote locations, the Grizzly bears seem to be indifferent to visitors. In some places I have seen a dozen or so bears together including mothers with cubs. So long as food is plentiful they seem to tolerate other bears and people. 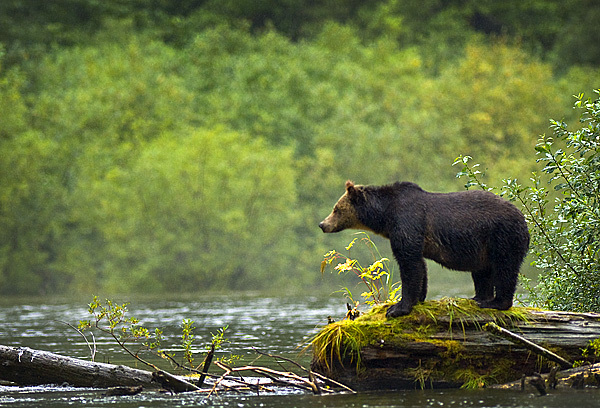 My favorite place to photograph Grizzly bears is next to the Atnarko river near Bella Coola, British Columbia. The river runs next to a road and there are several pullouts near fishing holes where you can park your vehicle and take photographs while the bears feast on spawning salmon in September. Just remember to leave your lunch at home. The most important elements of success in wildlife photography are location and timing. Other than that you need to have a long lens, a 70-200 mm lens is bare minimum, a 300 to 600 mm lens is best and a teleconverter can often be useful to get greater magnification. Always have your lens set to its widest aperture (e.g. f/2.8 or f/4) and don’t attach any filters as you need the fastest autofocus and shutter speed you can get. If the light is low, increase your camera’s ISO speed and try to get a shutter speed of 1\500 second or faster even if you are using a tripod or monopod. When photographing bears, as with most wildlife, try to focus on their eyes and watch for interesting behavior. Visit places where you will find bears. One way to do this is to join a tour group that specializes in bears, or visit parks and natural areas where they are seen frequently (e.g. Banff National Park in Alberta, Knight Inlet in British Columbia or Denali National Park in Alaska in Autumn). Use a fast shutter speed (1\500 second or faster) to stop the animalʼs motion and to minimize the time your camera is subject to vibration. Don’t feed or bait bears, and obey all local regulations regarding their viewing. In bear country, if you come upon a freshly killed animal, beware and move away quickly. If you are going to hike in bear country, bring along bear spray, bear bangers, make noise or bring along an air horn and I suggest you read “Bear Attacks: Their Causes and Avoidance” by Stephen Herrero. No matter where you live, if you are interested in wildlife photography, the best place to start is in parks or wilderness areas close to your home. Most natural areas support a wide variety of birds, and small rodents and these fast moving critters can be a challenge to photograph. To photograph animals such as bears, caribou, and deer, travel to locations where they are abundant and learn all you can about the biology of the animals before visiting. Finally, remember that no photograph is worth endangering your life or that of the animal. About the Author: Robert Berdan is a professional nature photographer, biologist and multimedia developer located in Calgary, Alberta, Canada. Robert uses both Nikon and Canon gear. Read more of his articles at his website, The Canadian Nature Photographer. Excellent article — I wish to make it up that way someday, I belong to Nikon.CA website group and some of the members are from BC. It’s absolutely beautiful there. Some of their photos are breath taking. Good advice and a very good article. I am a wildlife photographer from Sri Lanka n looking at possibilities to visit Canada for Grizzly photography n mean while capture what ever possible. Appreciate if you could let me know some tips n places to go n how to avoid getting high charges as i am not earning out of this but just a hobby so do not have lot of money to put for this kind of travel so I hope you will be able to help me out on this.